Foxcote House is an 18th century detached country house and it has been a Grade 2 Listed Building since September 1952. The front of Foxcote House contains large gardens. The house was constructed circa 1740, and its design has been attributed to Edward Woodward. It was the traditional family seat of the Canning Family; ten generations of the Canning family resided at the house until the death of Robert Canning in 1848. Following his death, Foxcote House was occupied by a private school, before its eventual purchase in the 1960’s by Christopher Boot Holman, an heir of the pharmaceutical retail company Boots the Chemist. The Holmans restored the house and it was sold by them in 1997 to the American lingerie billionaire Lex Wexner. The Wexners attend the annual shooting season each October and host traditional British shooting parties on the extensive estate. Ilmington is one of the ‘picture postcard villages’ of Warwickshire. It has many of the houses built with the local honey-coloured ironstone and mullion windows, lanes leading nowhere, small brooks meandering, and a backcloth of the soft undulating Cotswolds. In fact it is at the northernmost tip of the Cotswolds and is an area of Outstanding Natural Beauty. High up on Ilmington Downs is the highest point in Warwickshire from where there are excellent views over to Meon Hill, well known in the area for its association with witchcraft. The early name for the village was Elmington because it had so many Elm trees. When the Dutch Elm disease came to England, it killed all the trees and now none remain in the village. Ilmington is known for the many footpaths that criss-cross the village, particularly around the ancient fish ponds (now conservation) in the centre, and for the remnants of historic, multi-variety apple orchards. The parish church of St. Mary’s on Back Street is a fine Norman church and dates from about the early part of the 11th century, and boasts one of the finest bell-towers in Warwickshire. The church is unusual in the fact that it cannot be directly accessed by road, but instead by a network of narrow footpaths. The interior of St. Mary’s Church is full of interest. Robert (Mousey) Thompson of Kilburn carved the pulpit and all the pews for the church. He also carved his signature mice in eleven places throughout the church, and they are there for visitors to try and find. Another interesting thing in the church is the Ilmington Apple Map. June Hobson was a gardener and artist who lived in the village. She inspired the villagers to embroider the map that is a copy of old maps which showed where all of the orchards in the village were. It shows that there were an unusually large number of small orchards in the village and the map is on display within the church. There is also a short Apple Walk around the village which was devised by the children from the local school. There are two more former places of worship in Ilmington. At the end of Ballards Lane there is the former Ilmington Wesleyan Methodist Chapel building. On Upper Green is the former St. Philip’s Roman Catholic Church, but is now the home of the Ilmington Community Shop and Café. This is a beautiful building and has an iconic status within the village. It was built and endowed in 1867 as a school for Catholic children by Philip Howard, who was the husband of the heiress Elizabeth Canning, whose family were Lords of the Manor and lived at Foxcote House. The adjoining house was built for the schoolmaster, but by 1931 out of a total of 23 pupils only 3 were Catholic and the school closed. When Philip Howard died three years later it was decided to convert the former school into a church. It was opened by Archbishop Thomas Leighton Williams in 1935. The neighbouring schoolhouse became the Presbytery. The church closed in July 2013 and the building was purchased by the Village Cooperative in early 2015, thereby ensuring the building will remain in community use for future generations. With the closure of the village shop in 2012, it was decided to use the building for the Ilmington Community Shop and Café. Another building to be found at Upper Green is the Village Hall, which is on the corner of Foxcote Hill and Front Street. It was originally built in 1933 on land given to the village by Major Spencer Flower, and was extended through a Millenium Project in 2000. This is the centre of an array of community activities and groups. Also at Upper Green, are the remains of the Chalybeate Spring, and for a while the village had a reputation as a spa. The village war memorial is to be found on Grump Street, at Upper Green. Ilmington has its own Church of England Primary School on Back Lane. There are two public houses in the village. The Howard Arms at Lower Green is a 400 year old stone building and specialises in dining. The Red Lion on Front Street is a pub which is at the very heart of the village and local community. It is also the home of the Ilmington Cotswold Morris Dancing Side. The village benefits from a purpose built Multi Sport Club on Mickleton Road and which acts as the village car park for visitors. Crimscote is a tiny hamlet of houses and a farm and along with Whitchurch and Wimpstone is now in the parish of Preston on Stour. Alderminster is a beautiful small village and sits on the edge of the River Stour. The village is divided by the A3400, the through route between Stratford upon Avon and Shipston on Stour and was a part of Worcestershire until 1931, when it transferred to Warwickshire. The track of the derelict horse-drawn tramway from Stratford upon Avon to Moreton in the Marsh, one of the earliest lines in England, passes through the village by the roadside. Prior to the 1300’s the main part of the village was thought to be at the top of the hill to the north-east, but in 1348 the Black Death wiped out most of the inhabitants, and those remaining decided to group their homes near the church. During the English Civil War in 1642, troops belonging to Cromwell were stationed in the village before the Battle of Edgehill. wild flowers, animals and wildlife. There is an interesting and informative display documenting this diversity in the porch of the church. Many of the houses in Alderminster date back to around the 1820’s and were originally built for workers on the nearby Alscot Estate and a few are Georgian in style. Some 17th century half timbered cottages still remain on the east side of the main road, and on the same side, at the south end of the village, are two fine 18th century brick built tithe barns with tiled roofs. During the 1870’s a local landowner built 24 houses, the school and schoolhouse in the village. The school opened in 1872 and was used until 1971, when it duly closed. These buildings (now private dwellings) can be found at the end of the Old Shipston Road and near to the church. An ex-Army hut was used as a Village Hall but in 1962 a new building was erected in New Road for community use and for visitor parking. 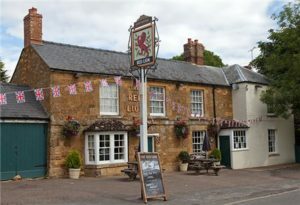 Alderminster has a public house called The Bell and is an 18th century coaching house and is now a part of the Alscot Estate.